So far, Jon’s estimates have the Oilers with 133 goals from Hall, Nuge, Eberle, Perron, Yak, Pouliot, and Purcell. With the 2nd line C a massive clusterf***, he (whoever he may be) could add anywhere from 10-25 goals. Let’s say 17 to put it in the middle. That gives the Oilers 150 goals from the top 2 lines plus 1. Last year, the Oil had 199 goals for in the season. Will the 3rd and 4th lines be able to put up 50 goals in one season? Even with MacT’s “3 scoring lines” mentality, it seems like our beloved Oilers might not even reach their total GF from last year. Yikes. Of course, this is all based on estimation, which has been long-proven a stupid thing to do from a hockey fan’s standpoint. Numbers based on not knowing who the 2c is going to be. And assuming no one on the top two lines get seriously injured and is out for much if the season. So they may or may not be conservative in hindsight 84 games from now. They went back to the 84 game season? I make that mistake all the time. Are you saying the blueline won’t score any goals? Last year they scored 30 goals, but only three on the PP. With the addition of Nikitin and Schultz another year older they will score more than three PP goals. So that leaves the 3rd line C and 4th lines to score a total of 20 goals. (You can’t say the 3rd line when you included Pouliot and Purcell in your 133 totals). JW also didn’t include EN goals, Oilers scored 8 last year, so toss in another 8 goals and based JW’s projections the Oilers are on pace to score more than last year. The Oilers were the 24th in goals scored last year last year. They damn well better score more goals this season. To be fair if they go into next season without another proven centre, I’d say it’s 50-50 that they’ll score more goals then last season. That said I do expect their to be an addition or two before the season starts. 32 more goals puts them in the top ten in scoring last year. Hard to see how one can be confident they can do that with the current center situation. And at 267 GA – dead last – the real issue shouldn’t be gF but GA. And again the weakness down the middle and the unknown/unproven in net make confident predictions impossible. If EDM can end the season with the same ga as gf it will be a huge achievement for the roster as it’s currently configured. You do know only three players scored over 40 goals last year. Care to rethink that prediction? Changes his number back and ..
And gives the entire NHL the finger. Just like Kovi. and it would serve us all. The more important thing than how many goals Yak scores is how much his game evolves away from the puck and his ability to play with and use his teammates. How many goals for comrade Yak? Depends. Are we including the 1 goal he scores in OKC after being sent down? How about the dozen he pots in the KHL after bolting like a Bolshevik? 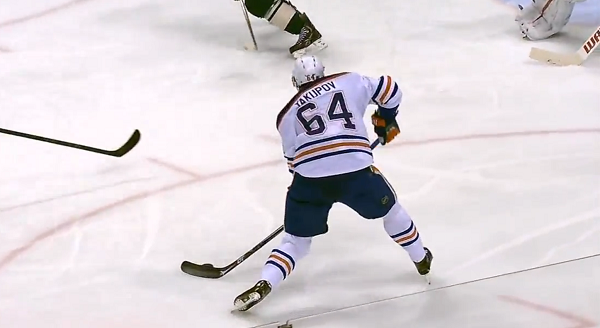 My predict is that once Yakupov finds his groove he will crazy explode offensively. Just looking at the goals in vid those are some pretty good goals and he does so in such a way it’s like my god this kid is gonna be awesome. But yea your 100% right. Our continually improving defence should mentally lighten the load for Yakupov. Perron not listed in Westcott column on Oilers site as a carry over to this year . HMMM- An error/omission on his part , or is there a trade involving Perron coming soon ? Perhaps with Montreal involving Galchenyuk(C) plus ? Pfft we should package you for a solid center or dman! It’s so difficult to predict this player right now. He has all the necessary tools to one day be a 40 goal scorer. But his issue appears to be reading the plays, understanding the systems, and putting himself in the right position to receive a pass and get his howitzer of a shot off. I can’t tell if he’s just too over zealous out there or if communication is the main hinderance with this player? In my mind what Eakins/MacT/ Coaching staff do or not do is going to tell us a lot about their abilities as much as Yaks. Get him tuned in and this could be a very different team this year. yaks will pull a bit of a stamkos and score 51 next year. book it. all seriousness though, 20 goals playing 3rd line minutes would be great.im happy with 20G20A. i think he can produce at that level. hes apparently training a lot this off season. i think he will bounch back. it could propel us into the playoffs. we were almost a .500 team in the lockout season and we were close to .500 in the last half of this season. mediocre defence plus young stars improving plus 2 years of the same head coach could get us a playoff spot IMO. I really hope Nail brings it this season, he’s got the potential to be a superstar. He seems to have a pretty solid work ethic but he seems to be lacking a little physically in my opinion (mainly skating speed). If he can bridge that gap the guy’s gonna be a superstar in my opinion. Yak’s a beauty, he’ll rebound and bring honour to the number 10. If you give your hard earned money to the Oilers at this time, you are part of the problem. I actually propped you on that!! It’s a sickness I have, it’s what I call Oiler addiction. I have been buying team Canada merchandise but my Oiler stuff is starting to wear out.Hope they turn the poop show around soon.I would like to go to a game again it has been three years for me now. Brett Hull was 24-25 before anybody knew where he was at. Not saying that Yakopov is Brett Hull as he could just as easily turn into a flop, but his deficiencies are identical. I think with the addition of Craig Ramsay, Yak Will have a great bounce back season. From all reports I’m hearing he’s working hard on his skating trying to get faster. Which will help him with his back checking. He knows if he wants the puck more he’s going to have to take it from someone’s stick. Ramsay will get a first hand look at the kids skills and use him on the power play he has a Hull of a shot. What I don’t get is why everyone wants to give up on this kid so much. His personality is jubilant, but you can tell he’s one of those players that needs a little coddling. He needs to know he’s accepted and needed on this team. And he is needed on this team. He could be a future 30-40 goal scorer. People need to relax on this guy and see what he can do at a full 100% season. Heck L.A., scored 198 goals last season, one less than the Oilers. Forgot.. they had 267 goals against! Got the NHL trophy for it. L.A., had 168 goals against. That’s where the cookie crumbles for the Oilers.. play a better defense game and you will win. Wild were in the playoffs, with 199 goals and 198 against. Philly, Ottawa, Wash, Tor, Wpg,Det, and NYI, all scored more goals than NYR,yet the Rangers were in the playoffs.